This is the official website of the German Society of Arizona. The German Society of Arizona was founded to further the German community and culture in the state of Arizona. To that end, we wish to be the premier focus of all things German in Arizona and uniting existing groups. We publish an event calendar of German events in Arizona and the newsletter German News AZ, your central source of information on German language and culture in Arizona. Our vision is to further the German community in Arizona and to celebrate German language and culture. Our mission is provide the central access point for anyone interested in German language and culture by providing an information clearinghouse about all things German in Arizona. Have a questions not answered anywhere on this website? Drop us a line! 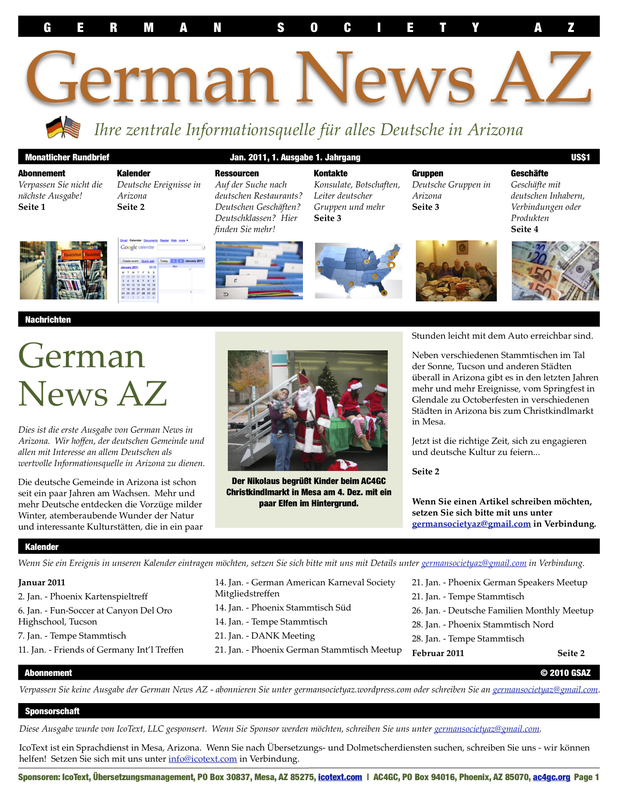 The German Society of Arizona publishes a monthly newsletter, German News AZ. In it you will find information on all things German in Arizona. From the calendar with German events in Arizona to resources like listings of German restaurants, German businesses, and German classes you will likely find it here! Or if you need to look up contact information for German consulates, embassies, or leaders of German groups in Arizona, look no further. In addition, we feature businesses owned by Germans or those with German connections or German products, so don’t miss the next issue! Check out the FREE sample now (or as an image of the German or English version, if you cannot view PDF files). January 2011: English and German version. Please also our download our news feed by right-clicking and saving on your computer, and then import it into your favorite news reader. If you would like to subscribe to the German News AZ newsletter, please use our secure subscription form. To receive the newsletter at a different email from which you are sending the request, please include the desired email address in the form’s comments section. Multiple subscriptions: please drop us a line! Bonus: For each referral of a new paid subscription, you receive credit for one issue towards your next subscription! Alternatively, you may also subscribe by email. Please send an email with the subject line “Subscribe German News AZ” to germansocietyaz at gmail dot com and let us know what subscription type and your contact information including your phone number if paying by credit card. and let us know what subscription type and your contact information including your phone number if paying by credit card. Terms: Subject to change. All per insertion. Published 12 times a year. Bonus: Purchase 12 insertions and get a 10% discount on a future order. Please fill out our secure German News AZ Advertising Form and we will get in touch with you, thanks!